300,000 honeybees live 14 floors above Front Street, atop the Fairmont Royal York Hotel. They’re very hard workers, flying around downtown TORONTO, and collecting annually about 800 pounds of honey. The bees search for nectar over a five or six kilometre radius from the hotel, pollinating plants in the downtown core, the Toronto Islands, the Don Valley ravines and city parks. The collected honey goes into cuisine and cocktails served in the Royal York’s dining rooms. The high-flying bees live in a herb garden, maintained by twelve apprentice chefs. The Queens Hotel (shown below) was demolished to make way for the Royal York, which opened in the 1930’s. In the 1970’s, some determined individuals brought into being two LGBTQ institutions which (through thick and thin) survive to this day. GLAD DAY BOOKSHOP, founded in 1970, almost went under, but was rescued by CEO Michael Erickson and others in the community. Through four decades, GLAD DAY has fought against censorship of gay and lesbian books, magazines, and videos. A mail order/info website – http://www.gladdaybookshop.com – has been launched. GLAD DAY is the oldest, continuously operating LGBTQ bookshop in the world. Founded in 1973, the Canadian Lesbian and Gay Archives (CLGA) has become the second-largest LGBT archive in the world. After years of operating in tiny, cramped offices, the Archive moved to 34 Isabella Street in September of 2009. The heritage building constructed in 1858, contains a reading room, art gallery, and a rentable meeting room for other community groups. An award-winning half-acre park, above a parking garage in the Financial District, is a good example of the value of development tradeoffs. CLOUD GARDENS, named for its on-site greenhouse, was given to the city in the 1980s as part of a deal allowing the Bay-Adelaide Centre to build higher than official planning allowed. The developers gave the land plus another $5 million to create a park. And what a fine park it is. Once on the skids, with the renovation of the delightful Dineen Building to the east, CLOUD GARDENS has been reborn as an oasis in the middle of downtown’s business centre. Designed by Baird Sampson Neuert Architects, the MBTW Group/Watchorn Architects, and two artists—Margaret Priest and Tony Sherman – the park consists of a series of interconnected terraces with bridges and ramps; an urban woodland on the west side; small greenhouse, thundering waterfall, and a monument honouring construction workers designed by Margaret Priest and assembled by the Building Trades Union. CLOUD GARDENS won the Governor-General’s Award for Architecture in 1994, and the Canadian Society of Landscape Architecture Regional Merit Award in 1995. I’ve seen these in VANCOUVER, and now TORONTO has them too. A brilliant idea from our city’s Water Department – portable drinking fountains making the rounds of public parks in 90 degree weather. As well, print material is available on preserving our water supply, and protecting the environment. Well done! 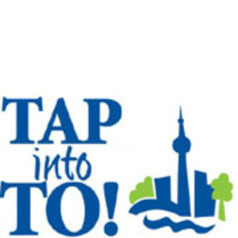 Toronto Ambassador Program guided tours – they’re free! 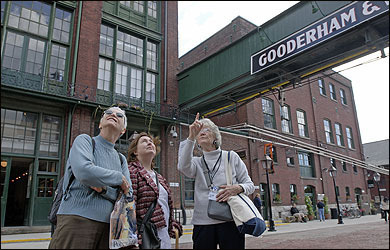 The TORONTO AMBASSADOR PROGRAM has been operating for several years now, and is becoming increasingly popular. Volunteer greeters number about 100. Book in advance, and one of them will introduce you to our city, show off our architecture, shopping precincts, theatres, gallery districts, restaurants, neighbourhoods, and a lot more. Best of all – it’s free, including a package of maps and guide books. No tips. TORONTO is the only Canadian member of Global Greeters. This organization has ongoing programs in many parts of the world. The list is regularly expanding. Some member cities: Saigon, Shanghai, New York, Chicago, Houston, Zagreb, Marseilles, Paris, Melbourne, Buenos Aires and Madrid. TORONTO has just finished a study on its tree population. Our 10.2 million trees occupy – surprisingly – only 20% of the urban landscape. Half of them are in excellent or good condition; countless others suffocate in concrete boxes along urban spillways and city streets. The TORONTO study, “Every Tree Counts”, tells us that “the structural value of our urban forest represents a staggering $7 billion. Furthermore, the environmental and social services provided by the urban forest greatly exceed the annual investment in its management. 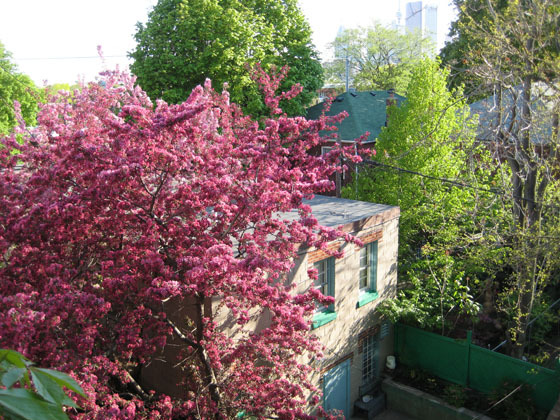 TORONTO plants about 84,000 trees every year. 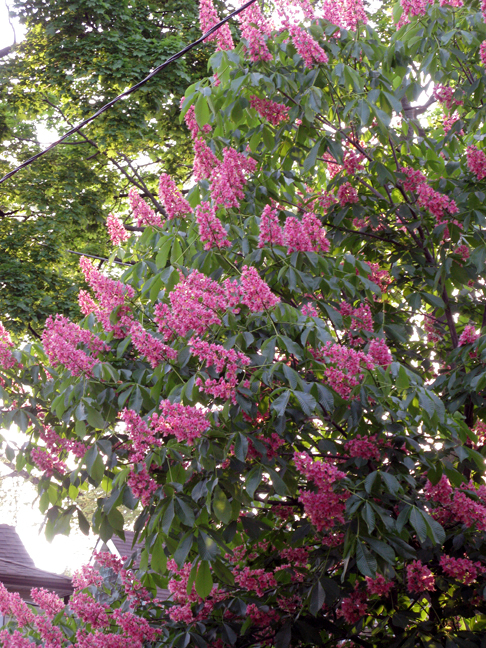 Approximately 54% of new trees in the city are regenerated naturally. The remaining 46% are planted. Spring and fall are spectacular seasons here, when our tree population looks its very best.